These stainless steel blades have an adjustable screw that allows the blade tension to be modified. 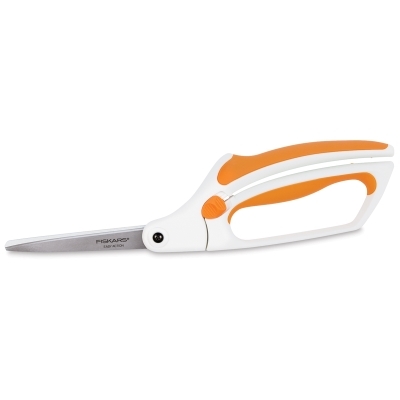 Softouch Scissors also have an easy action spring on their blades which reduces fatigue. The easy grip handle allows for right- or left-handed use. Use on fabric, felt, paper, and other materials. The Arthritis Foundation awarded these scissors an Ease of Use Commendation, which recognizes products proven to make life easier for people who have arthritis and other physical limitations. They're backed by a manufacturer's lifetime warranty. ® Fiskars is a registered trademark.®& Arthritis Foundation is a registered trademark. ™ Ease of Use is a trademark.